It's was all about style for this Pirate gymnast at the Jan. 10 meet at Highline. Highline High School used a solid array of girls gymnastic talent to post 130.65 points while outscoring Evergreen (86.7) and Tyee (71.4) in an SPSL 2A meet held at Highline on Thurs., Jan. 10. Unbeaten HHS closed in on a league title, as well. Senior Courtney Blanchet of Highline won the all-around by accumulating a 30.7 total based on sweeping the top spot in each individual event. Her first place scores were 8.9 on the balance beam, 8.2 on the vault, 7.4 on the floor exercise and 6.2 on the uneven parallel bars. "It was fun, tonight," Blanchet said. "I had a broken ankle last year, so my goal is getting to state. The bars were not quite what I wanted. I'll keep working on my skills. The balance beam makes me more confident because it just feels like I'm on top." Pirate teammates Alina Babchanik (24.0) and Lexi Weaver (22.7) snagged the next two spots while Shyla Grace scored a 21.3 fourth place for Tyee. Highline head coach Kevin Tessandore spoke about his team and the precariousness of competing while keeping athletes on the road to league and district. "I'm really happy for the win," he said. "I think we've got a strong team. There are some injuries and we want to be competitive for the end of the road. There are four seniors and we have a good middle group of athletes for next year. Courtney has still been a good shot in the arm. Tonight, in the all-around two more of our team were pushed into all-around action. When Alina gets more healthy, I expect her to be strong in the all-arounds." Placing behind Blanchet on the vault, were Babchinak (7.6), Abby Sagmoen of Highline (7.4) and Weaver (6.8). On the bars, Babchanik (5.4) was second, Nadia Osborne of HHS (5.0) placed third and Grace (4.5) earned the fourth spot. Balance beam featured a Nicole Brose of Highline (7.4) runner up, a Venus Nguyen of HHS (7.0) third spot and Pirate gymnast Emma Grothaus in (6.8) in fourth. 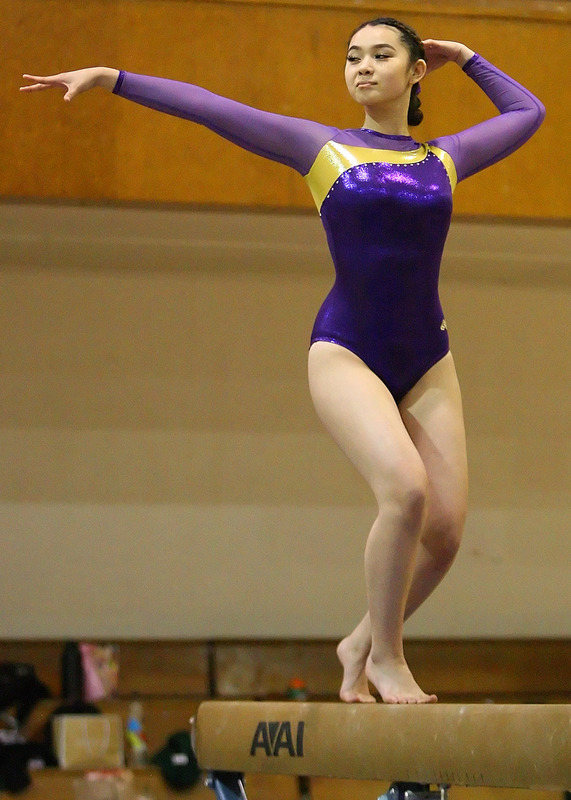 Nguyen danced to a 6.95 second place on the floor exercise as Highline's Kennedy Fulan (6.7) took third. Holding on to the fourth place at 6.4 was Sagmoen. At Evergreen, head coach Alex Harper and assistant Krystal Smith are in their second season of building up the Wolverines. "When we started, they were all beginners," Harper recalled. "Our veterans are in the second year of competition. the girls are focusing on their personal bests. The team leaves us speechless every day with their work, especially on the vault. They're driven and our numbers are improving. Better participation on each event might even have stronger competition for each spot." Tyee Totem head coach Alison Thomas is also building up her program. "There are lots of girls brand new to gymnastics," she said. "I'm impressed with their progress. They have a strong work ethic, are positive and uplifting. I'm excited to see how much they grow each season. Shyla Grace and Elizabeth Lopez Arriaga participated in district, last season. We want to add more girls to district." According to Thomas, captain Arriaga is a leader who is powerful and working on a back hand spring. Grace has great flexibility and presentation.